Please contact owner Phillip at 804-241-five four three five. Boat is located in Midlothian, Virginia. Are you ready to get your kids away from video games. This boat is for the whole family... waterski, wakeboard, towable rafting, wakesurf, or just cruise. 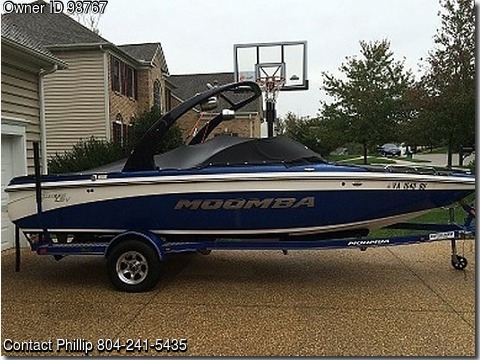 Moomba LSV is one of the best performing wake-board boats of all time. 23'6"' x 8'2" with ski/swim platform, Inboard Indmar 330 HSP engine with Digital Cruise Speed Control essential for skiers and wake-boarders, has an anchor, depth finder, mooring cover, 1800 pounds of ballast, and the Multisport Wakeplate allows you to create the perfect wake. Sleek looking and retractable tower helps skiers and wakeboarders perform at their best. Overhead Bimini offers shade, under seat storage, and built-in cooler makes the day most enjoyable. A Sony Sound System with MP3, CD, FM/AM bands with 8-speakers fills the boat with your favorite music. We are also offering our wakeboards 2, skies 2 sets adult and junior, towable raft, wake-surfboard, and life jackets. The color-matched BoatMate Trailer with disk brakes, swing away tongue, and torsion bar suspension makes towing and launching this boat easy. You may also consider keeping it in a slip in one of the nearby lakes or rivers for "jump in and go" ability. We found this to be very affordable with typical 20 year financing and economical gas usage. Contact me for questions or to see this boat in person.